Among the characters belonging to classical mythology Prometheus is a significant point of reference that accompanied Nietzsche’s philological studies and philosophical reflection since the years of his early adolescence to the full maturity. 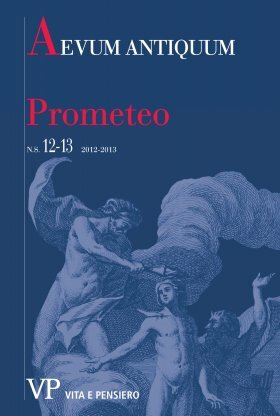 The reception of the Promethean myth follows two parallel and complementary directions: the theoretical and philosophical one, as an object of analysis in order to find some specific symbolic meanings, and the artistic and mythopoietical one, as an inspiration for the composition of dramatic works. The essay traces in a chronological way the reception of the myth of Prometheus in Nietzsche’s work focusing in particular on four moments: the one-act Prometheus (1859), the ninth chapter of The Birth of Tragedy (Prometheus as ‘mask of Dionysus’), the ‘Promethean’ fragments dated 1874, and some aphorisms extracted from The Gay Science (1882).